It’s a big decision…make the right choice. With expertise coming from 27 years of experience, Terri is consistently listed among the International President´s Elite and is in the top 3% of realtors nationwide. Despite these honors, she consistently attends continuing education and specialized seminars. Terri believes that feeling comfortable with an agent and developing a personal rapport is most important. She is always eager to meet new people and help them reach their goals. What she enjoys most is the satisfaction of being part of people´s lives, getting to know them, seeing their kids grow up, and seeing parents become grandparents. People respond to this level of caring. They send her their families and friends. In fact, Terri has sold nine homes to the members of one family. 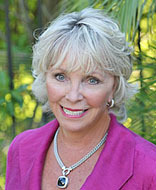 Terri is a California native and has lived in San Diego since 1972. A former paralegal and marketing director, Terri is adept in dealing with every aspect of your real estate transaction in coastal and inland San Diego County.